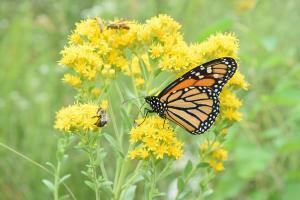 Iowa Natural Resources Conservation Service (NRCS) has two conservation program opportunities earmarked for landowners to implement monarch habitat practices: the Conservation Stewardship Program (CSP) and the Environmental Quality Incentives Program (EQIP). The next funding cutoff deadline for CSP is March 2 and for EQIP is March 16. Both projects offer higher payment rates on conservation practices compared to many other USDA conservation programs. Iowa landowners statewide have opportunities to receive planning and financial assistance of nearly $600,000 through two USDA programs to implement habitat for Monarch butterflies on their land. Through the EQIP Monarch Butterfly Habitat Development Project, landowners can add soil and water conservation practices on their farms such as conservation cover, contour buffer strips, and field borders that also help attract Monarchs. Your local NRCS office can help develop a plan to address Monarch habitat or other resource concerns, and assist with financial assistance. NRCS is also working with a group of conservation partners led by the National Fish and Wildlife Foundation through a Regional Conservation Partnership Program (RCPP) project called “Improving Working Lands for Monarch Butterflies.” This project uses both CSP and EQIP funds. Iowa is one of eight states included in the project. Additional practices such as grassed waterways, prescribed grazing, and conservation crop rotations are included as eligible practices in the RCPP project. To learn more about ways to implement Monarch habitat on your land, visit your local NRCS office or go to www.ia.nrcs.usda.gov.